Temperatures decrease at higher elevation along the vegetational gradient from the tropical lowlands to the montane forests. Freezing temperatures and snow are common in the higher Sierra Madre elevations. The upper elevational and northern distributional limits of tropical biota are typically limited by freezes. The extreme minimum winter temperatures in the Sierra are apparently milder than those in southern Arizona. 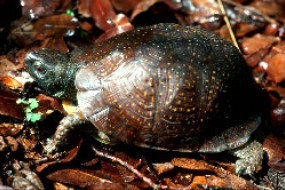 The spotted box turtle (Terrapene nelsoni) is occasionally found in tropical deciduous forest from Alamos to San Javier east of Hermosillo. 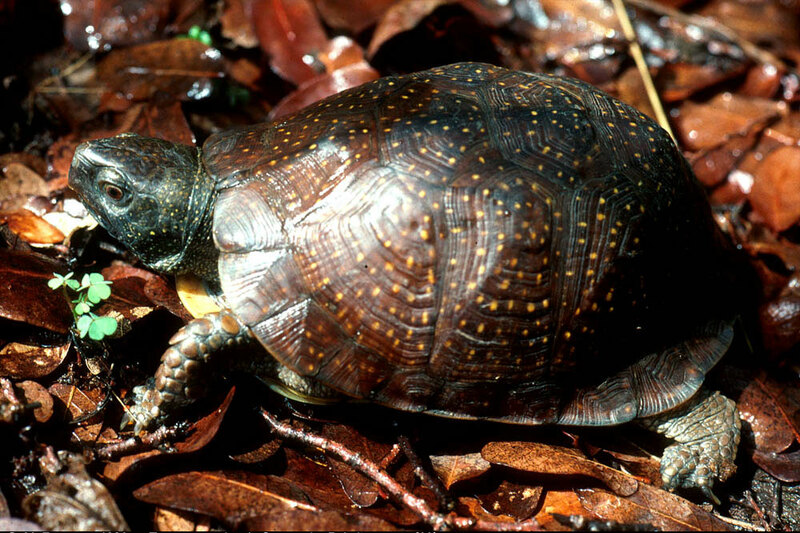 It is a tropical relative of the ornate box turtle (T. ornata) which lives in desert grassland from Texas to Arizona and northeastern Sonora. 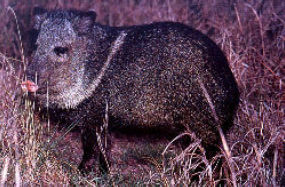 Individuals have been seen in oak woodland in the Sierra Madre. The spotted shell is typical. Photo: George M. Ferguson from west of Yécora, Sonora. 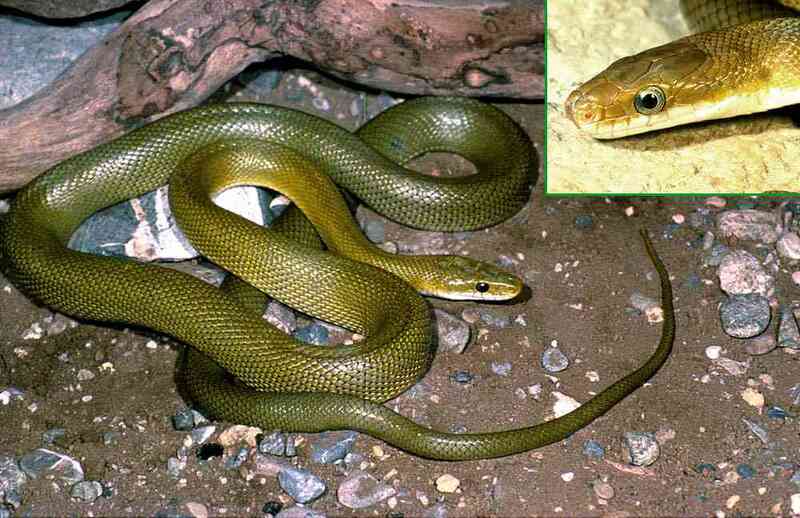 The green rat snake (Senticollis triaspis) is a common species often observed along MEX 16 from TDF to oak woodland near Maycoba. It differs from other rat snakes in that the females are much larger than the males. It is found in the United States only in southeastern Arizona where it is a secretive oak woodland animal from the Chiricahua Mountains west to the Baboquivari Mountains, and is of special interest to visiting herpetologists. Photos: R. W. Van Devender from Morelos (whole snake) and near Alamos, Sonora (head detail). The neotropical whipsnake (Masticophis mentovarius) is a large diurnal snake in tropical deciduous forests from Costa Rica to southern Sonora. It is common around Alamos. 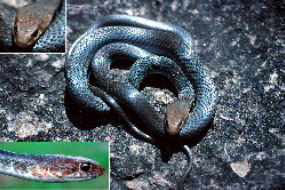 The specimen pictured here from east of Yécora was in an open, rocky, grassy area in open pine-oak forest. This is the northernmost locality known for the species. Photos: G. M. Ferguson. The west Mexican coral snake (Micrurus distans) is found from Jalisco north to southwestern Chihuahua and southern Sonora. 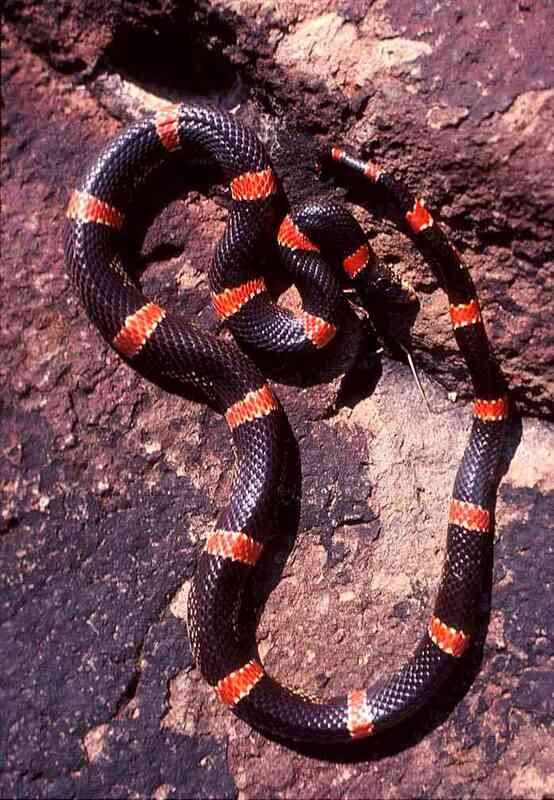 In southern Sonora, this brightly-colored venomous snake can be active day or night at anytime of the year depending on the weather. 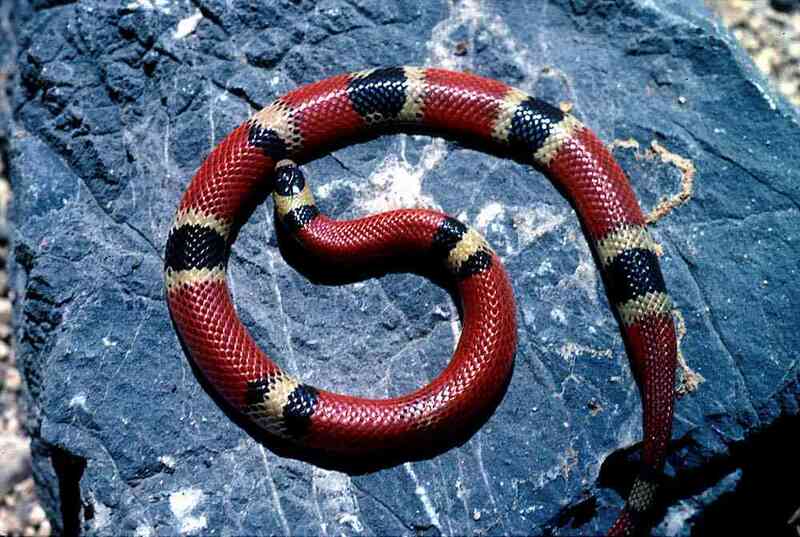 Like most coral snakes, it eats other snakes although in captivity they also feed on baby mice. 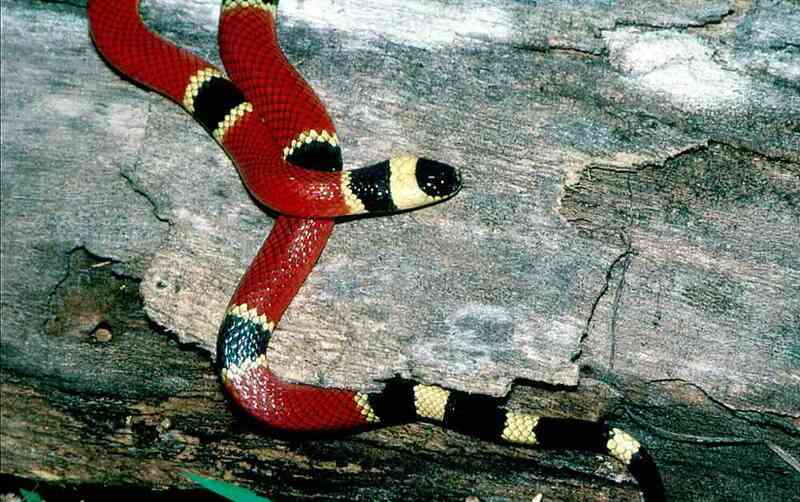 The resemblance between this tropical coral snake and the sympatric Sinaloan milksnake (Lampropeltis triangulum sinaloae) in size (up to a meter in length), color pattern (wide red rings) is remarkable. Photo: C.L. Abercrombie near Alamos, Sonora. 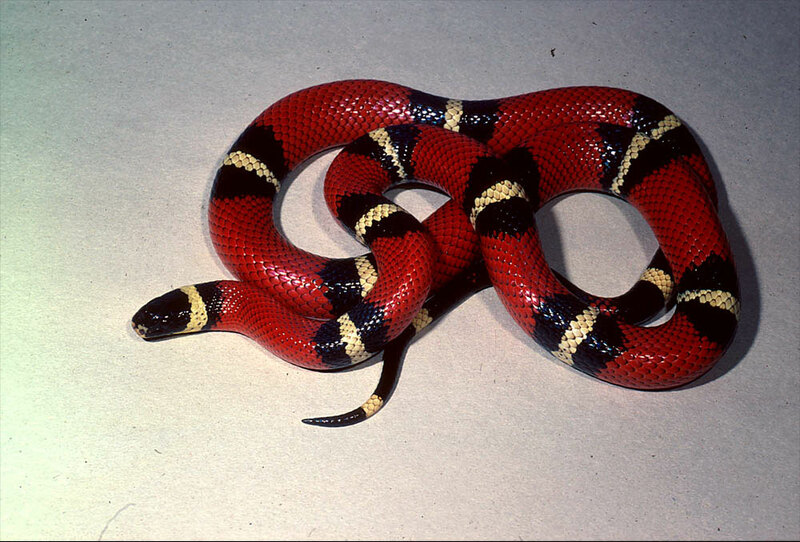 The western coral snake (Micruroides euryxanthus) is found from northern Sinaloa as far north as southwestern New Mexico and central Arizona. 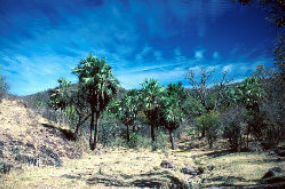 In southeastern Sonora it is in lowland tropical communities. The specimen picture here is from an open oak woodland near Maycoba, Sonora. This diminutive species like all coral snakes can be distinguished from non-venomous corralillos (mountain kingsnakes, filetail ground snakes, long-nosed snakes, and others) because the ringed pattern is continuous across the belly (inset). Photos by G. M. Ferguson from west of Maycoba, Sonora. 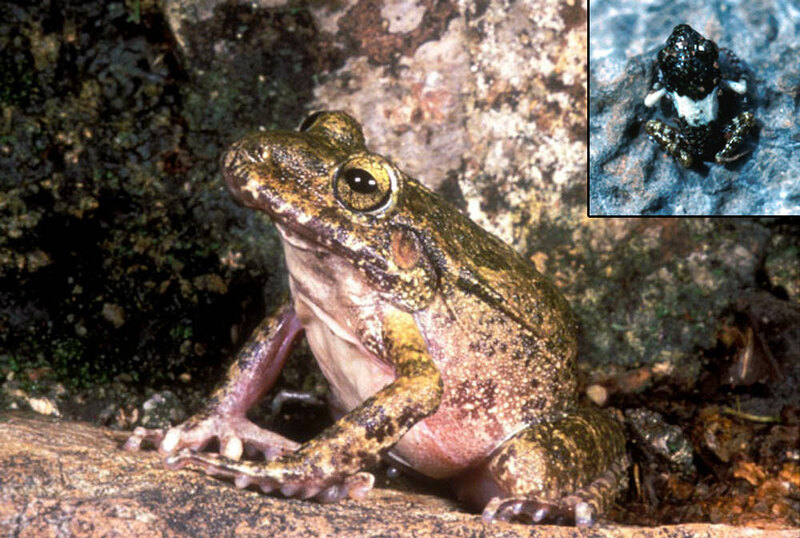 The barking frog (Eleutherodactylus augusti) is in the tropical family Leptodactylidae. It occurs from the Isthmus of Tehuantepec in southern Mexico north to central Texas, southeastern New Mexico, and southeastern Arizona. In southern Sonora the western barking frog (E. o. cactorum, above) lives in tropical deciduous forest on the Sierra de Alamos. It has often been seen inside a wet mine shaft at Aduana which is also used by a colony of the lesser long-nosed bat (Leptonycteris curasoae). In the Yécora area in eastern Sonora barking frogs are found in pine-oak forest on Mesa del Campanero as high as 2100 m elevation. In Arizona barking frogs occur in mountain islands of oak woodland near the Sonoran border. 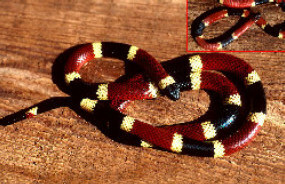 The juvenile has a broad white band across the body. Photos: C. R. Schwalbe from near Aduana, Sonora; inset: T. R. Van Devender from Mesa del Campanero, Sonora. 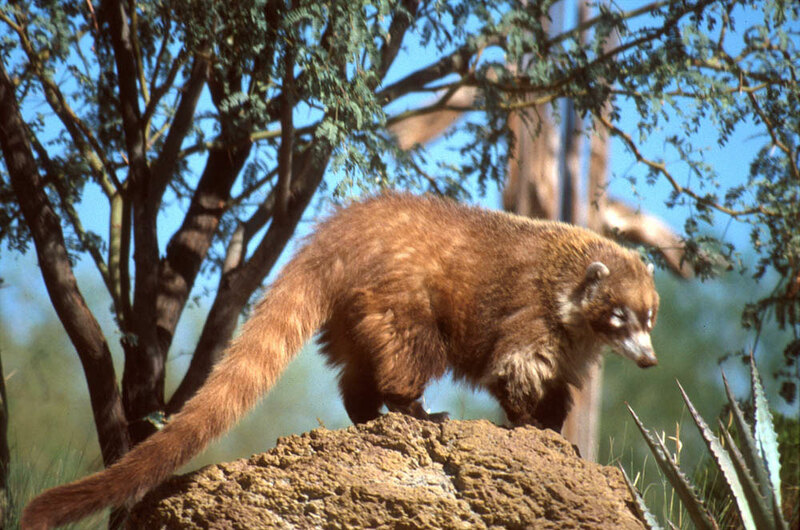 There are no references to the coatimundi (cholugo, chulo, solitario; Nasua nasua) in Arizona in journals of the 1824-1865 American exploration. Nor has it been reported as a fossil or from archeological sites anywhere in the southwestern United States. A specimen collected in the Huachuca Mountains in 1882 is the earliest record for Arizona. Observations of cholugos in pine-oak forest 2200 m elevation on Mesa del Campanero are especially interesting considering its apparent historical expansion into southern Arizona. Its current distribution from South America to central Arizona covers a huge ecological and elevational range. Photo: K. Krebbs. The ringtail (Bassariscus astutus) is a sleeker relative of the coatimundi and raccoon; it typically lives in rocky canyons. It is widespread from Texas to Oregon and south throughout most of Mexico. In the Yécora area it occurs in both tropical lowland and upland Madrean woodland and forest habitats. This animal (top) was napping in a palm tree (Brahea nitida) near Tepoca, Sonora. 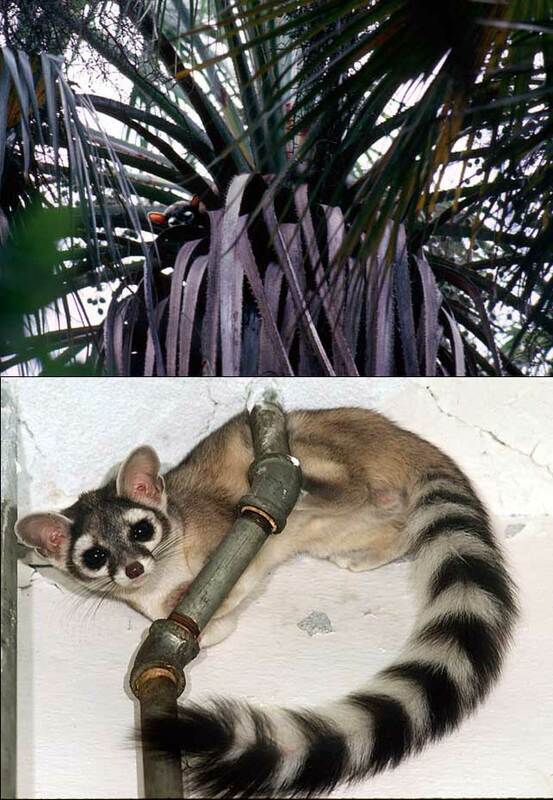 Ringtail are not shy around people and often live in buildings and mines. This animal (bottom) was living in the attic of the Carnegie Desert Laboratory in Tucson, Arizona. Photos: (top) C. W. Schwalbe; (bottom) R. W. Van Devender. 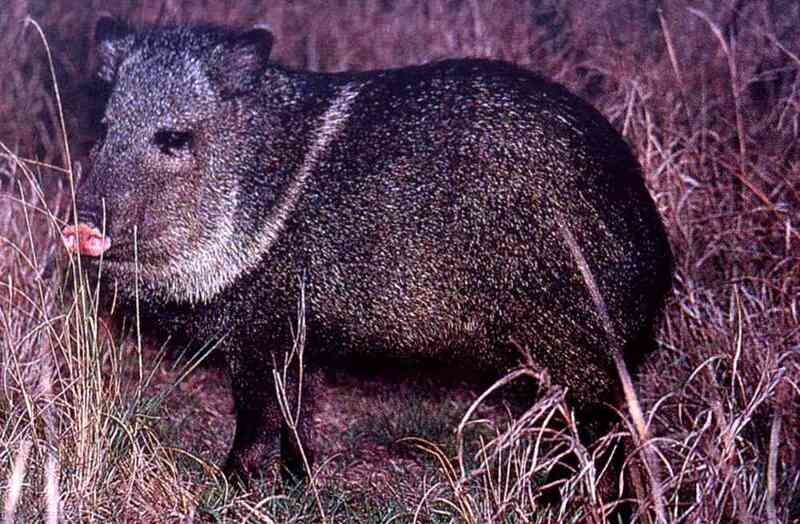 In Arizona the collared peccary/jabalí (Tayassu tajacu) lives mainly in the desert lowlands but is occasionally found up into woodland and forest at higher elevations below the Mogollon Rim. In the Yécora area jabalís inhabit all habitats from thornscrub and tropical deciduous forest up to pine-oak forest at 2200 m elevation on Mesa del Campanero. Photo: K. Krebbs. The Sonoran Desert toad (Bufo alvarius), the largest toad in the southwestern United States, occurs in many desert and lowland tropical habitats from northern Sinaloa to central Arizona. Since the completion of MEX 16 in 1992, many tropical and desert plants and animals have been expanding their ranges upward into oak woodland and pine-oak forests along the highway. 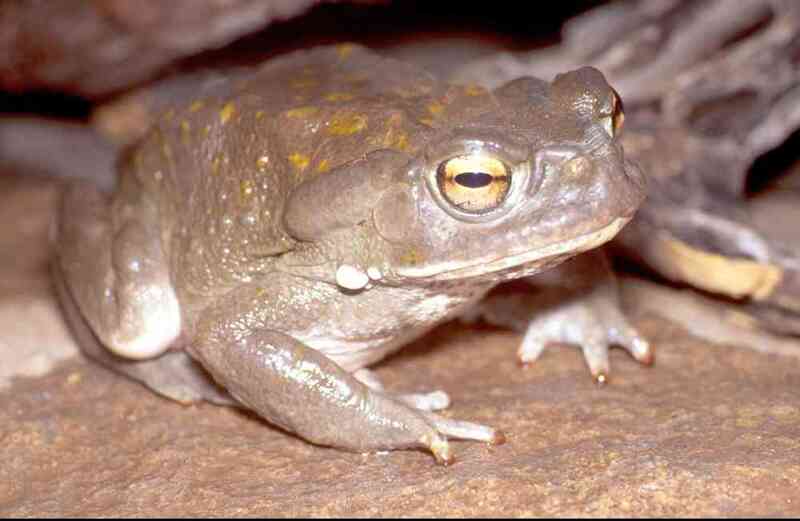 In the summer of 2000 a small dog died after biting a Sonoran Desert toad at Rancho La Palmita (oak woodland). The long-time residents had not seen them previously. Photo: R. W. Van Devender from Arizona. 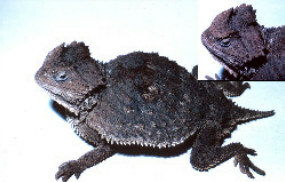 Above left: The mysterious, elusive rock horned lizard (Phrynosoma ditmarsi) was discovered on the 1890-1891 Lumholtz expedition through northern Sonora. Several specimens were exhibited at the Bronx Zoo in New York City in the early 1900's. In 1906 Leonhard Stejneger formally described them as P. ditmarsi in honor of Curator of Reptiles Raymond Ditmars. In 1969 Michael D. Robinson retraced the route of the Lumholtz expedition through northern Sonora under a grant from the Desert Museum’s Roy Chapman Andrews fund when William H. Woodin was Director. Woodin was a student of Charles H. Lowe, the legendary herpetologist-ecologist at the University of Arizona. Later Lowe, Robinson, and Wayne Howard discovered Sonoran populations of rock horned lizard first in the Sierra Manzanal southeast of Cananea (Lowe et al. 1971) and then in the Sierra Baviácora in the Río Sonora valley 130 kilometers to the southeast (Lowe and Howard 1975). Both areas are in oak woodland. In March of 1983 Bob Perrill in the Museum’s Botany Department photographed one southeast of the Río Yaqui on MEX 16 in tropical deciduous forest (Perrill 1983). This remarkable observation is about 160 kilometers south-southeast of previously-known localities. Above right: Bob Perrill’s observation was probably here, at Rancho La Mula west of Tepoca. The fauna in the rich tropical deciduous forest includes Tarahumara frog (Rana tarahumarae), lowland burrowing treefrog (Pternohyla fodiens), military macaw (Ara militaris), whitetail deer (Odocoileus virginianus), and Mexican gray wolf (Canis lupus baileyi, extirpated). Photos: (left) C. W. Howard; (right) T.R. Van Devender. 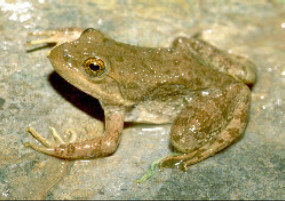 The Tarahumara frog (Rana tarahumarae) is a medium-sized frog in northwestern Mexico and formerly southern Arizona that superficially resembles the bullfrog (R. catesbeiana). It is a plunge pool specialist that lives in rocky stream canyons in tropical deciduous forest, oak woodland, and pine-oak forest. Vigorous populations mysteriously died out in Sycamore Canyon in the Pajarito Mountains and Big Casa Blanca Canyon in the Santa Rita Mountains in Arizona within a few years in the mid-1970's. Recent investigations point to a chytrid fungus as the cause of the mortality. The Museum is active in efforts to reintroduce the Tarahumara frog into Arizona. Photo: R. D. Bartlett from east of Yécora. 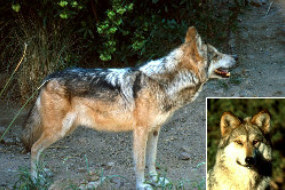 The last known Mexican gray wolves (Canis lupus baileyi) in eastern Sonora were seen at Rancho La Mula in 1981 as MEX 16 was being constructed (Carlos Meléndrez pers. comm. 2000). A professional wolf hunter killed a female and cubs. Enrique Holguín (pers. comm. 2000) killed the last wolf on Mesa del Campanero in pine-oak forest in 1966. Wolves were thought to have been extirpated from Arizona as early as 1926. However, there were regular reported sightings in southern Arizona as late as the early 1950s. These were likely coming in from Sonora. The Desert Museum has been part of a conservation effort to save the Endangered Mexican wolf since 1978 when a captive breeding population was established. 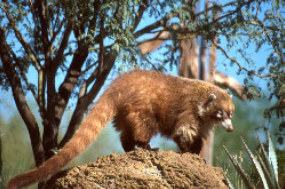 The founding animals were captured on the eastern slopes of the Sierra Madre Occidental in Chihuahua and Durango. Photos: K. Krebbs of ASDM captive.